Opis: The Future of German Industrial Exports - Herzog S.
Excerpt from The Future of German Industrial Exports: Practical Suggestions for Safeguarding the Growth of German Export Activity in the Field of Manufactures After the War<br><br>Through many years of activity as an industrial expert the author has gained an insight into the conditions of German industry and into its export activity. He has had an opportunity to compare its development and efficiency with those of other foreign industries. The War has created conditions and will be followed by circumstances which will shape and determine Germany&apos;s export trade in the future. These conditions must be taken into account and suitable measures adopted in preparation. New trails will have to be blazed if we are to overcome the obstacles ahead. An enormous task, worthy of the German people is to be performed. The Author ventures to hope that the present work may be able to contribute a little toward its accomplishment.<br><br>About the Publisher<br><br>Forgotten Books publishes hundreds of thousands of rare and classic books. Find more at www.forgottenbooks.com<br><br>This book is a reproduction of an important historical work. Forgotten Books uses state-of-the-art technology to digitally reconstruct the work, preserving the original format whilst repairing imperfections present in the aged copy. In rare cases, an imperfection in the original, such as a blemish or missing page, may be replicated in our edition. We do, however, repair the vast majority of imperfections successfully; any imperfections that remain are intentionally left to preserve the state of such historical works. 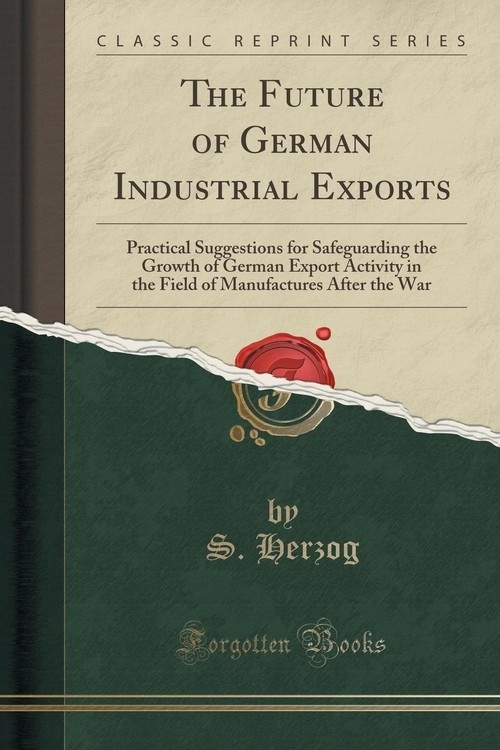 Szczegóły: The Future of German Industrial Exports - Herzog S.
Recenzje: The Future of German Industrial Exports - Herzog S.